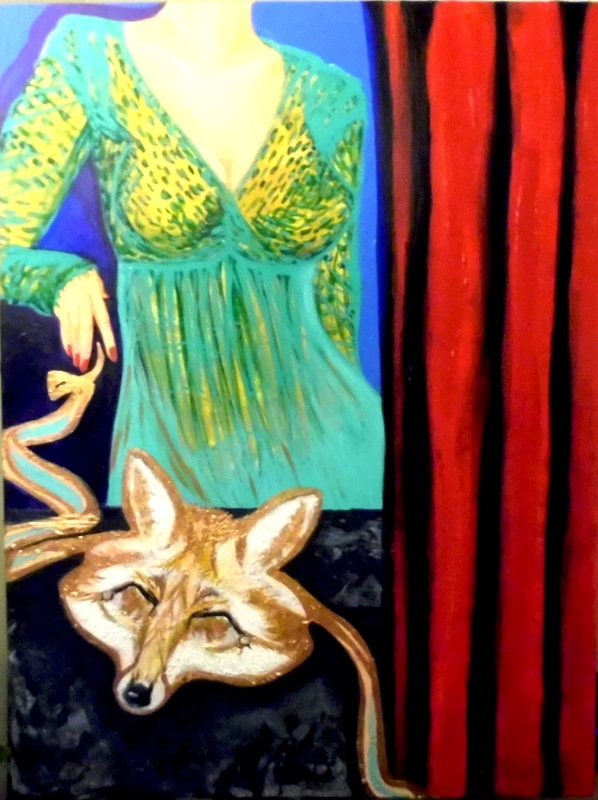 Fresh Coat of Paint: What Does the Fox (Mask) Say? 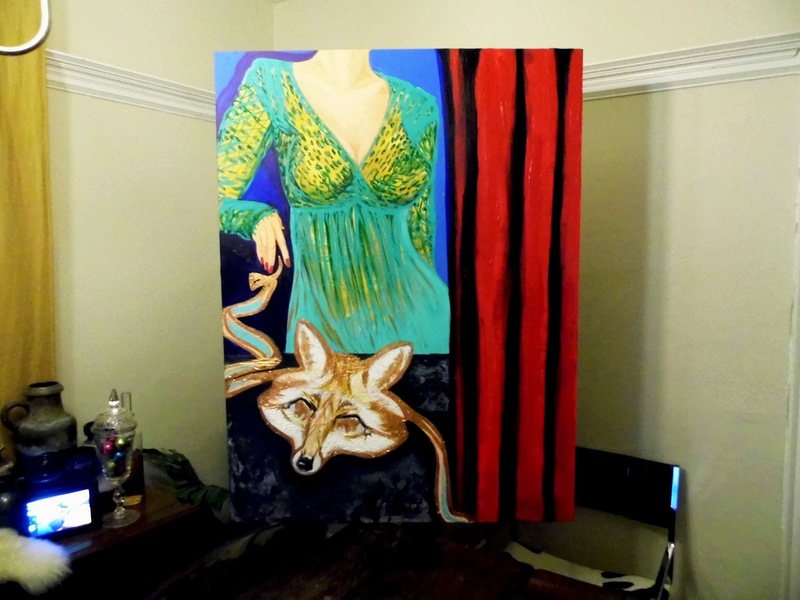 Last spring, I wrote about a good friend who would be painting something for us to hang in our new/old house. At the time, her instructions were "Nothing too weird!" because Corey prefers his art a little less shocking than I do. I, on the other hand, wanted something meaningful with lots of symbolism. 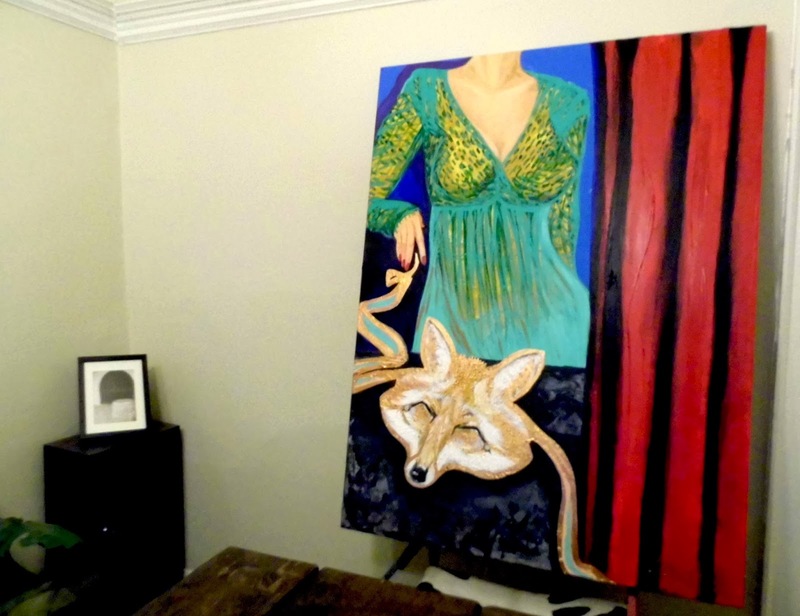 We knew back in the spring that the woman would have a fox mask, and I wanted a few other symbolic items. My friend managed to keep the painting relatively simple, while working in many thought provoking elements. Even the concrete ledge, theatre curtain and the way she's casting the mask away hold meaning for us. I was thrilled when Corey liked the painting as much as I did. It's dramatic and gorgeous with a depth which is hard to capture in photographs but I'm thrilled to give her a prominent home in our dining room. In person, the colours are quite different. The blue background is very deep and the dress underlay is gold, not yellow. We'll need to remove the plate rail (which we were planning to do anyway, since it's crooked.) in order to hang it at a proper height, but it will look perfect at the head of the table. Art is so personal, but we are thrilled with the painting and the fact that it was a gift from a dear and talented friend makes it even more special. We're so excited to introduce our newest dining room accessory. I think it will be perfect against the deep green wall colour we plan to paint our dining room eventually. What do you think?